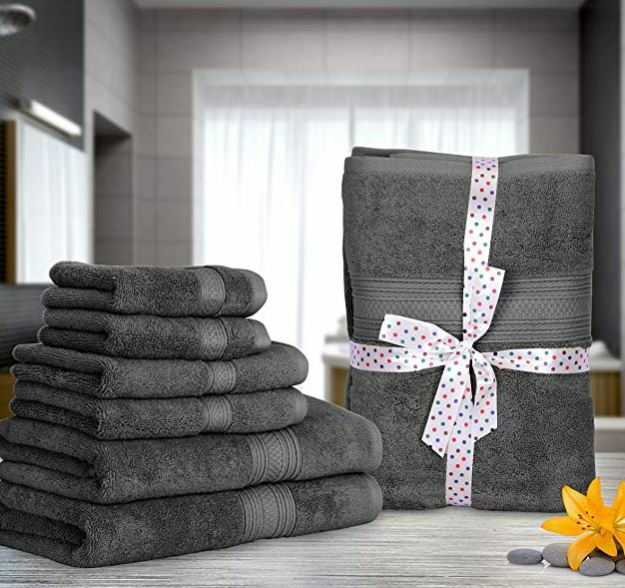 Deal of the Day: Save 58% 8-Piece 100% Cotton Bath Towel Set for 9/13/2018 only! How refreshing it feels to wrap yourself in a soft, absorbent, fluffy bath towel after a warm shower! Made of 100% cotton fabric, these towels possess breathable characteristics which make them perfect for your hands and body. With Deal: $25.49 & FREE Shipping. Set includes 2 bath towels of 27 inch by 54 inch; 2 hand towels of 16 inch by 28 inch; 4 washcloths of 13 inch by 13 inch. Woven with 100 percent ring spun cotton. Machine wash the towels in warm water using mild detergent and tumble dry on low; recommended to dry immediately to minimize mildew. Do not use bleach, fabric softeners, and iron as it may damage its quality; always wash the towels separately to minimize lint. Made from natural materials and no harmful chemicals or synthetic materials are added, which is safe for you and your family.